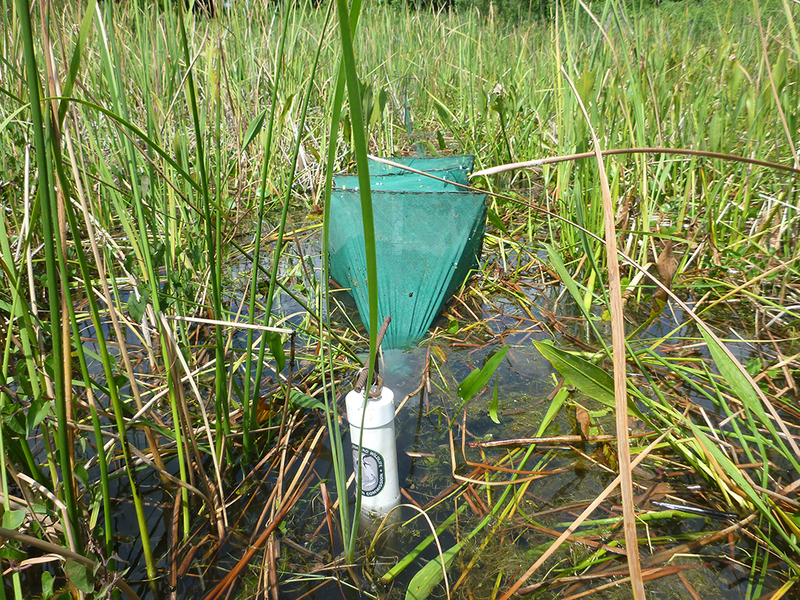 A shallow, vegetated area in Lake Kerr (low productivity) where fisheries biologists deployed a mini-fyke net and dissolved oxygen logger to evaluate the influence of lake productivity on fish community composition and dissolved oxygen regimes. 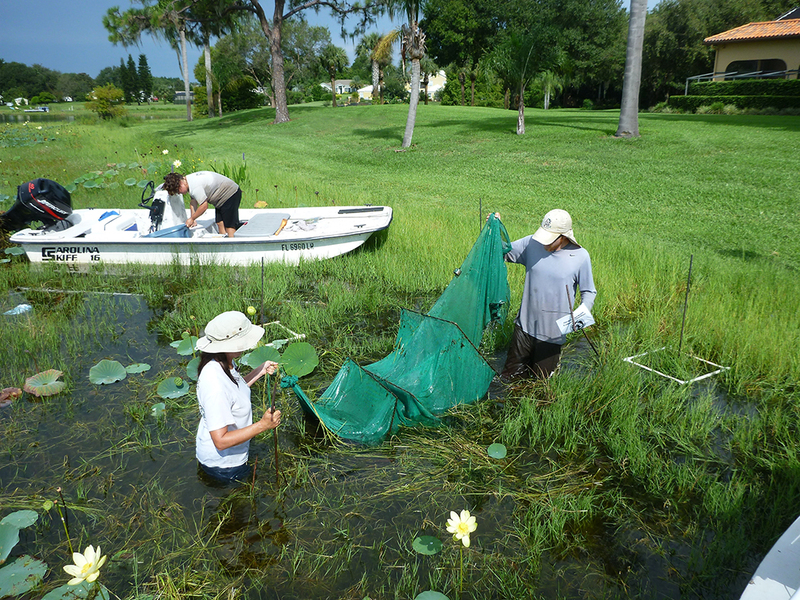 During the summer of 2015, fisheries biologists deployed mini-fyke nets (MFNs) and dissolved oxygen (DO) loggers in four Florida lakes to assess the influence that lake productivity has on fish community composition, dissolved oxygen regimes, and habitat structure in shallow, vegetated areas of lakes. The four lakes evaluated were Lake Kerr (low productivity), Lake Dorr (medium productivity), Johns Lake (high productivity), and Lake Trafford (very high productivity). For each lake, the same 18 sites were evaluated during two sampling events to assess temporal variability of fish community composition and DO data collected at each site. The MFNs and DO loggers were deployed overnight, and the DO loggers were programmed to collect water temperature, DO, and conductivity data every 15 minutes. 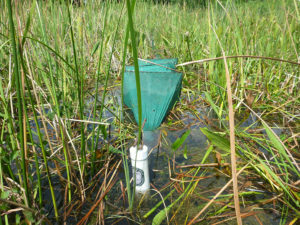 Additional environmental data was documented for each site including aquatic plant density and organic sediment depth. Once the MFNs were retrieved, biologists identified, counted, and measured all fish species collected. Biologists deploying mini-fyke net in a littoral zone site on Johns Lake. Our results showed that fish community composition was similar between sampling events within lakes, but differed among lakes. Within lakes, duration of hypoxia (DO < 2 mg/L) did not differ between sampling events. However, higher productivity lakes (Johns and Trafford) had longer durations of hypoxia than lower productivity lakes (Kerr and Dorr). Differences in environmental data (e.g., aquatic plant density and organic sediment depth) were detected among lakes but rarely between sampling events within lakes. Understanding how lake productivity influences fish communities, DO regimes, and habitat in near-shore lake environments is important for effective aquatic resource management and policymaking.